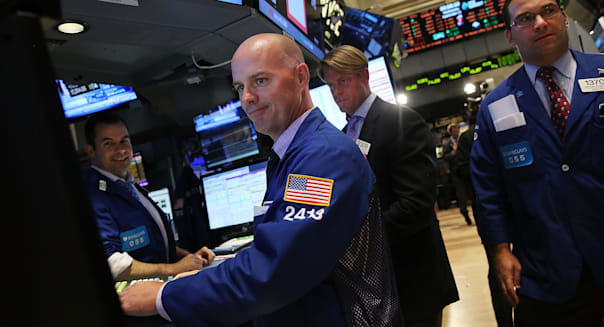 Stocks rose Friday, shrugging off a weaker-than-expected retail sales report and concern over whether the Federal Reserve may pull back on its stimulus, as Fed officials prepare to meet next week. The Dow Jones industrial average (^DJI) jumped 75 points, or 0.5 percent, to 15,376. With Friday's gain, blue chip stocks recorded their second best week of the year. The Standard & Poor's 500 index (^GPSC) gained 4 points, or 0.3 percent, to 1,687 and the Nasdaq composite index (^IXIC) rose 6 points, or 0.2 percent, to 3,722. Traders had a few economic reports to work through. The Commerce Department said Americans increased their spending modestly in August, roughly 0.2 percent, half of what economists expected. The sales report was a mixed bag. Shoppers spent more on cars, electronics and furniture, but they didn't buy much else. Last month, several retail chains including Nordstrom (JWN), Macy's (M) and Walmart Stores (WMT) cut their profit forecasts for the year. The government also reported that wholesale prices rose 0.3 percent last month. During the past year, prices have only gained 1.4 percent, a sign that inflation remains modest. One thing driving wholesale prices higher was energy, which spiked as a conflict with Syria appeared likely. Investors were also anticipating the Federal Reserve's policy meeting Sept. 17-18, where the central bank is expected to decide the future of its bond-buying program. As a group, investors expect the central bank to reduce its current $85 billion in monthly bond purchases to about $75 billion to $80 billion. Trading was light as Wall Street headed into the weekend and the Jewish holiday of Yom Kippur starts at sundown. In commodities news, benchmark U.S. crude fell 39 cents to $108.21 -- down from a two-year high of $110.53 last Friday -- as concerns about Syria retreated, and gold fell $6.90 to $1,323.40. In corporate news, Fiat and Chrysler CEO Sergio Marchionne said the Italian carmaker is no closer to acquiring the 41.5 percent stake in Chrysler held by the United Auto Workers health care trust, known as VEBA. Marchionne said the trust wants $5 billion for its stake, which is too much. Fiat took control of Chrysler as it emerged from bankruptcy in 2009 and now owns a 58.5 percent stake. Vitamin Shoppe (VSI) shares fell, touching their lowest level since early 2012 after a Sterne Agee analyst cut his rating for the stock to "Neutral" from "Buy," citing a recent slowdown in its website traffic and sales. Vitamin Shoppe shares lost 2.7 percent to $40.85 after dropping as low as $40.01. Ulta Salon, Cosmetics & Fragrances (ULTA) surged as the company's fiscal second-quarter profit jumped 28 percent on stronger sales at its growing chain of beauty product stores. The stock jumped 17.3 percent to $117.49. Coal sector shares fell ahead of next week's unveiling of a carbon emissions-rate standard for new fossil fuel power plants. Alpha Natural Resources (ANR) dropped 2.4 percent to $6.21, Peabody Energy (BTU) lost 3.2 percent to $17.98 and Arch Coal (ACI) fell 3.5 percent to $4.68. Intel (INTC) shares gained 3.6 percent to $23.45 to rank among the largest contributors to the S&P 500 after Jefferies boosted its rating on the chipmaker to "buy" from "hold" and upped its price target to $30 a share. Suntech Power Holdings (STP) said its CEO, David King, is stepping down. The news sent the struggling solar company's shares up 8.4 percent to $1.29 in Friday trading. Galena Biopharma (GALE) plunged nearly 15 percent to $1.94 after the company sold 17.5 million shares of stock at $2 a share. Shares of Sonic (SONC) lifted a marginal 0.4 percent to $17.98 after a William Blair analyst reaffirmed her "Market Perform" rating on the drive-in restaurant operator and raised her quarterly earnings estimate to 30 cents a share. Sonic hit a 52-week high Thursday of $18.25 a share after reporting strong August sales. The Federal Reserve reports August industrial production at 9:15 a.m. Eastern time. -Compiled from staff and wire reports.